Over the past two decades, civil society has played a pivotal role in Europe, from the demise of Communist rule to the reunification of Europe, followed by the expansion of the single market to the reconstitution of democracy in the enlarged European Union. European civil society has emerged as a social space between EU governance and the citizens of the member states, populated by non-state agents claiming to represent, speak for or participate on behalf of the most varied social constituencies in EU decision making. This book consolidates European civil society research by re-viewing its conceptual, normative and empirical-analytical foundations. With contributors from political science to sociology to law, it captures the evolving practices of European civil society that stretch across the national (local), the European and the global realm. 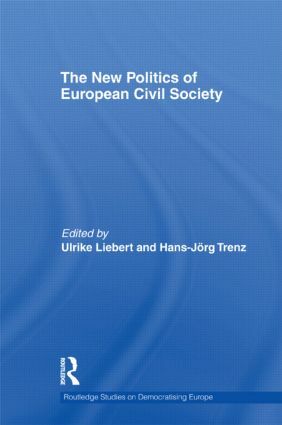 Developing an analytical framework that highlights the interplay between civil society building and polity building from above as well as from below, within the legal and institutional framework of the EU, they examine whether and how civil society can contribute to making democracy work in normative democratic theoretical perspectives. This book will be of interest to students and scholars of civil society, European politics, political science and sociology. Ulrike Liebert is a Professor of Political Science at the University of Bremen, Germany. Hans-Jörg Trenz is Professor at ARENA, University of Oslo.